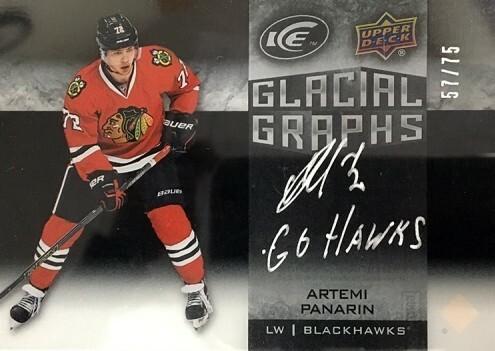 Again returning as a standalone set, 2015-16 Upper Deck Ice Hockey continues as an acetate-centered release. Boxes feature one hard-signed autograph and one memorabilia card. 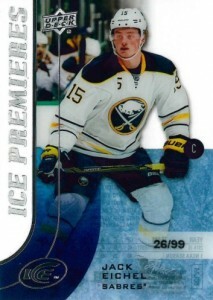 The 200-card base set kicks things off and added rarity comes courtesy of the Ice Premieres Rookies and players including Jack Eichel and Connor McDavid. Available in multiple tiers, the most common rookie players are numbered to 1,999 and the rarest players, Level 1, are numbered to 99. There are also Autograph (#499, 199 or 125) and Autographed Patch (#/10) versions. 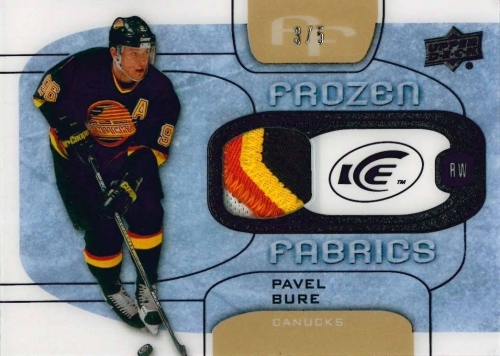 Not just limited to the present, 2005-06 Retro Ice Premieres feature the earlier design. 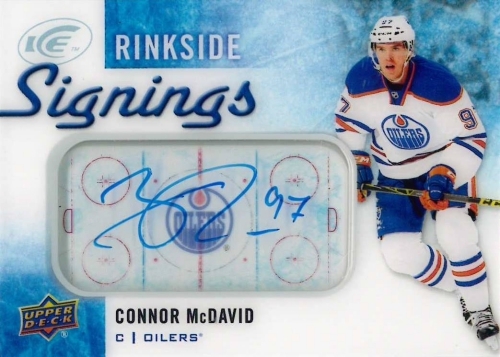 The Ice Premieres inserts combine to average three per box. 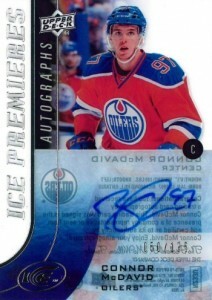 Only showcasing on-card signatures, the autograph inserts continue the quality theme of UD Ice. This includes Glacial Graphs (1:32 packs), Ringside Signings (1:64 packs), Signatures Swatches (1:64 packs) and Superb Script (#/49). 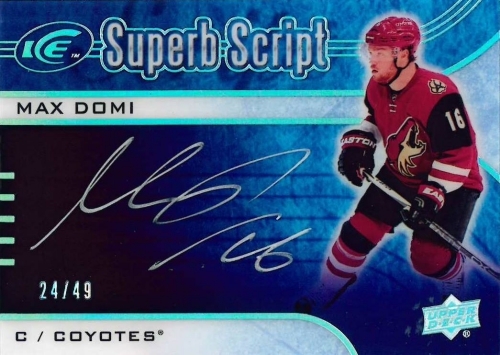 There are also Superb Script Portraits, numbered to 15. Collectors can also find four relic inserts in the release. Among these, Frozen Foursomes offer four jersey pieces from four different players on the same card. 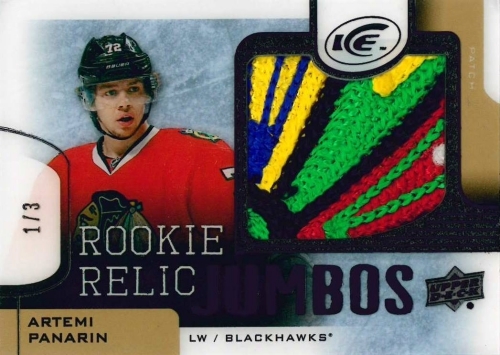 Other options include Frozen Fabrics (1:24 packs), Fresh Threads (1:24 packs) and Rookie Relic Jumbos (#/299). All relics are also found as limited Red and Black parallels. 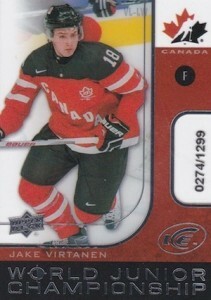 More traditional inserts include Global Impact (1:8 packs) and World Juniors Championship (#/1,299 or 699). Lastly, part two of the multi-product Exquisite Collection inserts can be found in UD Ice. With one Exquisite card per box, there are several choices available. This includes base Legends (#/499) and Rookies (#/399 or 299), as well as Signatures, Rookie Signatures, and 2003-04 Rookies Auto Patch Tribute. 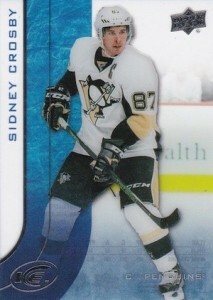 Limited Gold Spectrum (jersey #'d) and Black (1/1) parallels add to that total. 100 cards. Shop for complete base sets on eBay. 35 cards. Serial Numbered #/10. 30 cards. Overall odds 1:24 packs. PARALLEL CARDS: Red Patch #/49, Black Patch #/10. 23 cards. Overall odds 1:24 packs. PARALLEL CARDS: Red Patch #/30 or #/15, Black Patch #/5. 15 cards. Overall odds 1:128 packs. 42 cards. Overall odds 1:32 packs. PARALLEL CARDS: Black #/75 or less. 32 cards. Overall odds 1:64 packs. 30 cards. Serial Numbered #/299. PARALLEL CARDS: Red Patch #/15, Black Patch #/3. Overall odds 1:64 packs. Specific group odds noted below. PARALLEL CARDS: Black Patch #/15, #7, or #/3 (#SS-MS - 1/1). 23 cards. Serial Numbered #/49. 15 cards. Specific pack odds and print runs noted below. PARALLEL CARDS: Gold Spectrum #/97 or less, Black 1/1. 10 cards. Serial Numbered #/25. PARALLEL CARDS: Gold Spectrum #/5, Black 1/1. PARALLEL CARDS: Gold Spectrum #/35, Black #/10. PARALLEL CARDS: Gold Spectrum #/15, Black #/5. If you have any issues with Upper Deck cards for quality control, please let them know at qa@upperdeck.com. You will need a upc code and a receipt. So you’re supposed to get: 1 auto, 1 memo, 1 exquisite card, 3 ice premeries per box….that’s fine and dandy but please don’t be fooled…at about $160-175CAD per box there’s easily the potential of getting jack squat in terms of value. Don’t get me wrong – I’m not living in a fantasy where I believe each box should match the value of cost (even though that would be sweet) but you would think you would at least be promised at minimum; 1/2 of your value of cost. 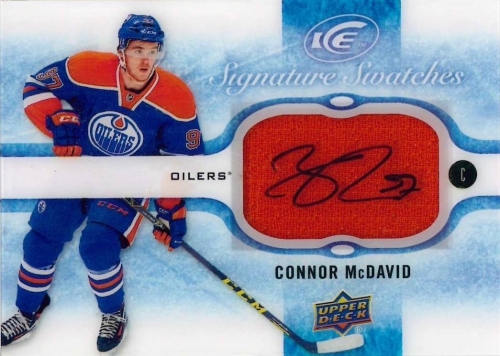 I’m just not at all impressed with UD this season…they’re taking advantage of this McDavidmania to the max and I get it – they’re a business after all but it’s not a smart move for the longevity of the hobby. I’m going to sit through one single case break for free and that’ll dictate if I’m going to roll the dice. Totally agree with you JG. And to add to your comment, it seems that Upper deck is now aware that group breaks seem to be the future, hence the high cost of most of their products. Sad sad sad!!!! Upper deck is ruining the hobby for me! Ice is a horrible product to buy boxes. Singles only cuz like JG said you get no value & 90% of the boxes have jack squat! The cards they print are decent looking but you would think that ther be better control at printing time as it has shown this season too much damaged cards. Yes they will replace how though they really don’t cleary say how. In other words will they reprint the same damaged card sent in, or will they just give an other card from any where they see fit. If they give an other card the big question should be where do they get the other cards from to give you as replacement for the damaged card, same goes with redemptions cards when the redemption cards have expired what do they do with the rest of the cards do they keep them or destroy them thus it would ceate a much bigger short print on the redemptions cards that are not redemmed or they just keep the cards and give those as replacements to other cards that are damaged. As for redemption cards they should not be in pack period, unlike Mcdonald or Tim Hortons Hockey cards you would find a redemption winner card and you could easily get the card where it be a patch/jersey/auto so how come Upper Deck puts redemptions cards in ther hockey products and they cant fulfill them not even in 2 years after product release. Surely, this is my favourite product in terms of design and overall conception, but boy UD got greedy! Let’s check some numbers. There will be a total of 142,890 Ice Premiers rookie cards, which means 47,630 boxes produced. This means you get around one Ice Premiers Level 1 at every 144 boxes, or, if you want, one at every 9 cases. Also, the total of rookies Ice Premiers Level 1 represent 0,69% of the total of Ice Premiers rookies. Of course, the number per se, means nothing. Let’s just compare it with Ice Hockey 2014-15. 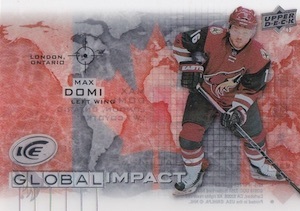 There were 53,516 Ice Premiers rookie cards, which means 17,838 boxes produced. This means you get around one Ice Premiers Level 1 at every 54 boxes, or, if you want, one at every 3 cases. Also, the total of rookies Ice Premiers Level 1 represent 1,84% of the total of Ice Premiers rookies. In a nutshell, while the number of Ice Premiers Level 1 remained the same for both seasons, 990 (10 players /#99) and the number of Ice Premiers per box also remained the same (3/box), the number of total Ice Premiers rookies increased almost 3 times this seasons compared to 2014-15. This means the product got diluted, as almost all the products this season. You get three times less chances to hit a Level 1 compared to last year. Most probably you’ll get stuck with a worthless rookie card numbered on 1999. Why would you even number a card on 1999 anyways? Besides that, not only they increased the number of rookie players, but also they increased the serial numbers for every level, except level 1. Even level 2, this season is #/499, while last season it was #/249. A Noah Hanifin #/499 will sell for 3$-4$, and that’s level 2. So yes, the product is awesome, I love it, and if they would have kept the last season number of boxes and rookies, it would have been the product of the year, but with the overproduction, I’m afraid is a huge loss of money. That being said, a McDavid or an Eichel will worth a small fortune I believe. When you release a checklist, you might want to get someone to double check it before releasing it. For example, you list cards FF-DK, FF-TS, GG-AP, GG-NH, SS-NL, ERS-BM and ESRP-AP without player names next to them. Dana � Hi Dana, I apologize for any confusion. We double-check everything we post. The reason those were not included in the main listing is because they are only found in the parallels. However, I understand that initials are not clear as to the player in question and it has been fixed. Anyone thinking of joining group breaks and paying $300+ for Edmonton might want to rethink their purchase and let the other idiots buy spots and come away with Slepyshev/Khaira/Musil ICe Premieres. Of course there are 20+ other Connor cards especially the Ice Premieres Auto Patch /10 which will show up 1 in every 277 cases. Good luck everyone. You’re right, my mistake. I was dead tired when I did the maths. You’re also right about the odds to find an Ice Premier Level 1 in a box. I forgot to divide by 3, since there are 3 per box. My number 144/3 means you will get one every 44-45 boxes, as you said. Again, my mistake! That being said, it changes nothing regarding the validity of my final conclusion. Since I also forgot to divide by 3 the number of total boxes for the season 2014-15, this year product is 3 times more diluted than the one from the last year. The last year you could get one Level 1 per case. I bought 2 cases and I pulled Gaudreau and Teravainen. All in all, sorry for the maths, but my conclusion was right. Also, don’t be so harsh on the guys here. They do a wonderful job, and I believe we can live with some minor faults, especially that they put online for us hundreds of checklists. Also, seeing how you dealt with the maths and corrected me, you’re very bright. I’m sure you figured out that ERS-BM is Brock McGinn, since in the list of players for that specific set there’s no Brad Marchand. Same goes for GG-NH, where there’s no Nugent-Hopkins, and for the others as well. Apologies about the TS and T.C. mistake. Also didn’t mean to offend the staff (as they really do a great job) as this is my go to place when checking out checklists. Also want to point out, when we are referring to cases, we mean Master Case not Inner Case so people joining 8 Box Inners will have to adjust odds (it gets worse). Dana � No offense taken. We try our best to always provide timely and accurate information. We are proud to be a free resource for collectors and never want to give confusing or incorrect info. Dana, you forgot that “retro” ice premiers are included in the 3 premiers that you get so the number for boxes go up. The Rookie class is really weak? Jesus mate, if this year is really weak, what can we say about last year? Or two years ago? Anyhow, everyone is entitled to its own opinion, I’m just wondering why you’re saying this is a REALLY weak crop. In the end, I don’t know if the reality confirms our predictions made here on the forum. I opened 3 cases, which means 48 boxes. That means I should have pulled 144 Ice Premiers Rookies. I pulled 173 Ice Premiers, 26 Ice Premiers Retro, 21 Ice Premiers Auto and 1 Ice Premiers Variation Patch. Even if we consider only the base Ice Premiers, it still means the ratio is 3.6/box. If we take into account the Retro too, it means 4.15/box. Also, the conclusion about the Level 1 Ice Premiers proved to be wrong too. I’m not saying the maths were, I’m saying the reality was different from our predictions, since I pulled 3 Level 1: Bennett, Domi and Panarin. This means 1 per case, exactly like the last year. If I count the Retros where I pulled McDavid, it means 4 per 3 cases. Did I got crazy lucky or is there really at least one Level 1 per case? Anyone else? 1. This is a great product with a great design but watered down and overpriced this year, no doubt about it. But, compared to SPx, that Contours crap, and Trilogy this stuff is actually better value. 2. McDavid overrated? No chance. Is his stuff currently overpriced? Yes. Will it drop 70%? No. Irony is that its all the guys refusing to buy boxes chasing the McDavids on eBay driving up the prices. 3. 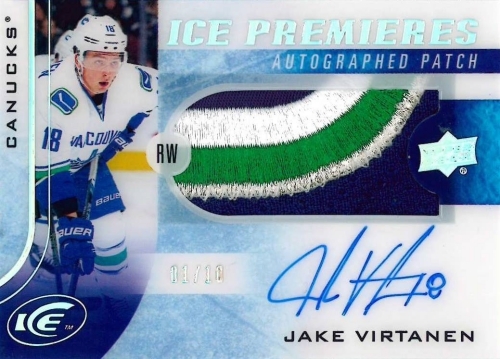 Ice premieres /99 maintain value like crazy, ultimate /99 doesn’t even compare historically. But, this year a short print rookie premiere is astronomically hard to hit. I can’t even imagine the odds on hitting a Rookie Premiere Patch /10 (which have been, and will always continue to be money in the bank). “Did I get…” not “Did I got…” Sorry about that. Excellent comment. I totally agree with you. This is my favourite collection in terms of design and structure. This year is overpriced and watered down, yes, for sure. But I still rate it a 3 stars. Cards look splendid. Quality is very good. The patches are nice. The rookies are numerous. Yes mate, indeed, it’s not hard at all to beat those horrible, horrible collections: SPx, SP Game Used and most of all, Contours. Boy, that was a bad product. In conclusion, keeping in mind the crap UD offered us this year on a silver plate, I’d say Ice is way above the average. But….for 150$ I need more than some McJesus, sorry, McDavid-Cards. The #1999 and #1499 Ice Premiers are not worth the money. A typical product for group-breaks, Edmonton for 300+$ (Connor-Hunter) and 200+ for Detroit, the rest for around 15-20$ for an inner case. Give it a reason why the Vancouver Canucks are so overweight in this product? Upper Deck took a great product for last year and made it so watered down with nobody rookies numbered to 1999 or is it 19,999? Hard to give it two star product. Broke an inner case of 8 boxes and bought two more, thinking it had to get better, it didn’t. I did not get a single Ice Premiers rookie under 999 for the entire break, not even one numbered to 499! Autos were low tiered rookies, no patches of any kind, every dime sized if that jersey swatch was a dull one color swatch. Myy case hit was a Bobby Ryan auto numbered to 15, which was not a big deal. Last year, this was my product of the year, this year below average to maybe avoid like the plaque. Good discussion about this product. I agree with a lot of your guys’ comments. After leaving the hobby in the 90s due to over production it’s clear that nothing has really changed, other than they’re jut overproducing by splitting card production into many different redundant products. If all these jersey/patch cards are in fact authentic then some of these players must have worn 20 jerseys per game. Mate, that’s the trick. These jerseys and patches are not games-used materials. They are event used, which means used in autograph sessions, photo shootings, etc. There are hundreds of them for every player :) Some collections, SP Games Used for example, put game used jerseys and patches. Spx is by far the worst – just one example- pulled a blank redemption card. Yup, blank. No sticker. Still dealing with the headache 2 months later…. Sp game used – always exciting anticipation. And pretty much always major disappointment. 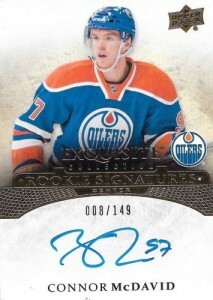 Did pull an inked sweaters mcdavid redemption though. But still, overall, prob most gut wrenching series of the lot. So. Much. Allstar crap. Trilogy – prob most “fun” overall. Until you realize you have 6 Hartman level 1 autos…..did pull the most mcdavids, larkins, and panarins here though. Also scored major gretzky patch hit, mcjesus signature pucks, auto /499, 4 level 1 /999, 3 level 1 /399, basically loads of decent to better rookies. Also loads of crap rookies. 5 retros – including 2 nick Ritchie……again, no one good. 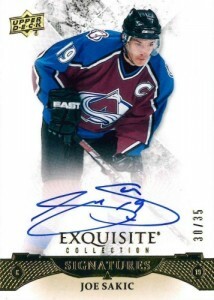 3 /499 autos – nick cousins being the big one…..
Biggest hit was prob lemieux /15 frozen fabrics red patch. No mcdavid. At all. Zero. No larkin. No panarin. So kinda bust that way. But millions of ice premieres /1999. Which is ridiculous. Basically ice is ok, but like it all, about $50-60 too expensive. Per box. I don’t think I’ll even bother with SPA. But somehow always feel kinda like UD is the mafia. And we’re making them so much money for, really, very little in return. Seriously, just pull a damaged (and heaven forbid – an awesome card) card and see how quickly you will see this all for what it really is. UD have a monopoly and they are laughing all the way to the bank. 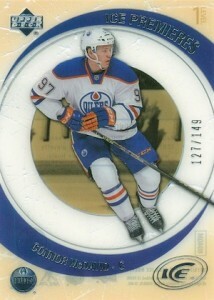 1 level 1 premieres /99 ehlers which would be up there for case hit, and indeed, it is a nice hit for sure. Too expensive. Too, way too, much filler. But fun if you’re ok with wasting a grand. Or two. This is my favorite product of ud of all time. I usually will open 1-2 cases a year. Until now!!!!! After doing a random group break and watching basically nothing get nice get pulled other than a bennett retro /149 and a lot of crappy autos I noticed how watered down this year is. I had pre ordered a 8 box case and didn’t want to screw my local card shop as I have good relations with them. I pulled a Malkin auto jersey and a whole lot of nothing RCs and autos . With the price point way up from other years and less chance at hitting good cards. I would advise staying away. 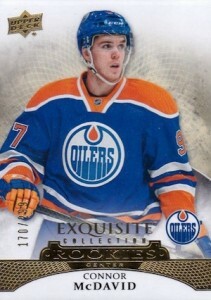 This is the nicest looking product they have released but too much money for nothing unless you hit mcdavid. I have now cancelled my sp authentic case and cup case I pre ordered. I’m sick and tired of giving upperdeck my hard earned money for nothing. I will now save tens of thousands of dollars and just buy the cards I want which will be cheap cause I’m not collecting mcdavid (if I even do that) I hope someone from upperdeck reads these comments and tried to fix the problem they have created. 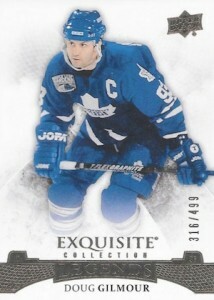 As a customer I want upperdeck to tell me why I should spend my hard earned money on there products. 2_ more redemptions than I’ve ever seen which in 2 years they won’t honor them and just do what with the tons of extra cards who knows?? Maybe another buy back product and they don’t care. Start honoring all redemptions. If you can’t get them in don’t put out the product. Atleast panini has said they are honoring all redemptions. 3 all products are so watered down getting a good hit is basically impossible. 4 most products are now based around group breakers, who can really afford to spend 2-600 bucks a box for 4-8 cards. And pull crap. 5- upperdeck customer service is really really bad. Train your employees to treat your customers with respect and have answers not just give us the run around . We the hobby collectors are the ones keeping you in business but for how long who knows. I was told by there great customer service we don’t honor expired redemptions and never have . But if you simply go on you tube you can watch videos of people who they have help customers out and sent a replacement. If you honor 1 customers you should honor them all. Basically here’s my break down. I’ve been collecting upperdeck since they came out in 1991. Spent over 200000 dollars on there hockey products since then and this is basically it’s the last strAw for me. It’s a shame now with a son who loves hockey I refuse to spend any time or money buying there products anymore. I’ve now realized I’m not the only one thinking this way it’s 80-90% of hobby collectors. If they don’t do something to fix the issues and start listening to what people are saying and complaing about you won’t be around much longer. This exclusive licence has allowed upperdeck to do what ever they want sounds like a monopoly. I hope the nhlpa steps in and reads people’s comments. Until upperdeck either gets it together or tells me why I should give them my hard earned money I will wait till Panini comes back and will move my hobby to more game used jerseys,sticks, and other. Which is a shame cause it helps bond me and my son together cracking packs and boxes. It was a great hobby. I did give 2 stars on this product cause the design is good. I’m a big time wax collector, I think the addition of exquisite to this product makes the product better. before with ice all you were hoping for was the 99 star rookies, which wer very hard to pull. in my open if you got a mediocre case of this years ice versus a mediocre case of last years ice you probably took the same monetary hit. in any event I pened probably 20 boxes of ice starting with a case and then three or four at other times. the case was horrible no 99 no great exquisites probably best card was rinkside signing and superb rookie scripts of non exciting players. but I didn’t quit breaking wax thank god. the next twelve boxes yielded the big one mcdavid rookie ice to 99, mcdavid superb scripts auto, mcdavid exquisite rookie auto, mcdavid rookie, larkin superb scripts auto but was a redemption, fabbri gold spectrum rookie exquisite patch auto and a Lemieux material auto. 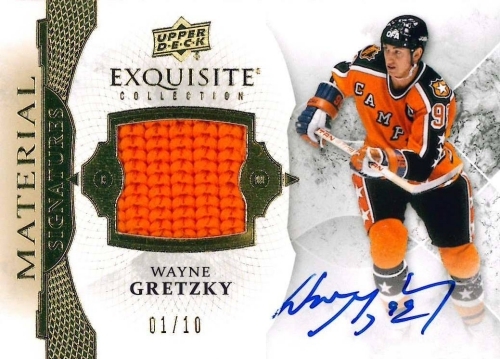 you have to decide if the product can produce big hits and the ice 99 rookies are always big hits — if so you have to keep cracking wax even if the first crack was bad. Dave’s reply above is 100% on target. Sums up exactly what me sense is as well. And the whole thing about US stores not being able to ship to canada (and vice versa) for 1 calendar year is absolute nonsense. And, I would add, absolutely illegal if anyone had the $$ to bring a federal anti-competition (collusion I believe is the term…) case against them. Class action suit anyone. I kid of course….kind of. I agree 100% with Damone. I actually do not buy cases anymore because I get much better pulls when I buy individual boxes. I have had great luck pulling high end cards from this set and every other set except series 2. As far as not having your kid collect cards because you are not pulling high value cards is crazy. The point of this hobby is to collect players and or teams you like and not even think about the value. Who cares about the value! As long as you are not collecting them for a living, just be wary about how many boxes you purchase, especially at this price. I do agree that the prices have gotten a little out of control, especially for kids who want to collect. It should be fun, not stressful. Especially when a parent wants to collect with there kid. Compared to what some other sets where selling for per box compared to this set, at $130 a box I think was the best bang for your buck. Best of luck if you decide to make future purchases! I used to love Ice. I have purchased an enormous amount of UD product this year and Ice by far had the most terrible return. I opened 3 master cases and would be lucky to have 20% value of what I paid. It is so watered down I don’t know where to start. In two of the cases (next to each other on a pallet) I got almost identical cards. Both were terrible. The third case has better cards than the first two combine but was still not enough to salvage anything. Upper deck you need to stop mass printing cards. You’ve watered down things to the point that breaking even on a box has about the same odds as winning the lottery. At least in the past you came away with something. I really want to support this company. I love busting cards but I might as well burn 80% of my disposable income in a bonfire. Terrible terrible value.